This past Sunday I had the opportunity and honour to preach at my old home church, enCompass Church, while the pastor was away. Below are my notes. Both Jesus’ saying & these stories illustrate a basic human truth – we will always move towards what we focus on. It begins in v. 51 with Jesus looking forward towards Jerusalem. The NASB says “He was determined to go to Jerusalem.” The NIV says “He resolutely set out for Jerusalem.” The original Greek says “he set his face steadfastly to go to Jerusalem.” That phrase, “to set one’s face” is an ancient Hebrew idiom. Jesus was determined & resolute to go – He looked forward to Jerusalem, and began journeying in that direction. And the passage ends in v. 62 with Jesus “No one, after putting his hand to the plow and looking back, is fit for the kingdom of God.” It’s all about looking forward. And in between these two bookends, if you will, Luke gives us four examples of what ‘looking back’ can look like. The first example occurs right away, when Jesus and His crew attempt to pass through, and probably stay in for a night, a village of Samaria. The rivalry of the Jews & Samaritans was legendary, and it was largely based on religious differences. They both worshipped God, but differed on where that worship was to take place. Now, in many circumstances Samaritans would let Jews pass through their territory, but since they knew Jesus was specifically going to Jerusalem, they said “no.” They probably thought He was going to worship in the temple there, which they disagreed with, and so they were being jerks about it. The Jewish historian Josephus tells of accounts of Jewish pilgrims to Jerusalem being harassed and even sometimes killed by Samaritans as they passed through Samaritan land. So maybe it’s better that this village said no to Jesus. In any case, James and John, two of Jesus’ closest disciples, are pretty upset by this denial. “Hey, that’s our Master you’re denying. He’s the Son of God – no one does that to Him!” They want to call down balls of fire from Heaven onto that village. They would have made great ‘Fire and Brimstone’ preachers nowadays. Jesus had called these two guys “Sons of Thunder” when He first chose them, which is a pretty cool nickname IMO. Maybe this is one of the reasons why. But that response seems kind of random, though, doesn’t it? Not really like what Jesus has been teaching at all. Maybe they were thinking about it the whole time they were with Jesus, and just waiting for the right opportunity. Maybe not. In any case, they had just seen Elijah and Moses appear to Jesus at Jesus’ transfiguration, and they probably remembered when Elijah called down fire from Heaven on some soldiers. It happens in 2 Kings 1. Elijah prophecies that a king of Israel will die from illness, and understandably the king’s not too happy about it, and sends 102 soldiers to go get Elijah. But instead of going with them, Elijah calls down fire from heaven on them and kills them all. I could see how power like that would be appealing. John and James look back to the prophet Elijah, and so they miss what Jesus is doing. They’re missing what the kingdom of God under Jesus’ reign is like. A kingdom that seeks forgiveness & reconciliation, not retaliation and revenge. And so Jesus rebukes them, and they leave the village alone (later Jesus names Samaria specifically in the Great Commission). Jesus is looking forward to Jerusalem, where He will fulfill all things, but James and John look back to Israel’s past. This begs the question – Do we look back to our pasts too? That doesn’t mean not remembering the past, or not learning from it. Looking back to our past means that we long for it, wish things now were like they were back then, maybe when we felt God’s blessing more, or we had better finances, or when more people attended church. It also means letting the past dictate what we do now. “But that’s the way we’ve always done it” is looking back to the past. To be honest, I struggle with forgiving myself for past mistakes and sins I’ve done in the past. But when I do that – when any of us look back to our past failures, or even our past successes – we’re missing what Jesus is doing in the here and now. What He wants to do with and through us. We can’t wallow in our past sins or boast in our past successes if we are to be fit for the kingdom of God. Jesus continues on his journey towards Jerusalem, and has three successive encounters with potential disciples. They’re also our examples two, three, and four of what “looking back” can look like. The first man Jesus encounters, we’ll call him “Moe” because that’s easier than “Man 1,” initiates the encounter by boldly telling Jesus that he will follow Jesus wherever He goes. Jesus’ nature-inspired response is “The foxes have their holes and the birds have their nests, but the Son of Man has nowhere to lay His head.” Jesus is referring to Himself in the third person here, and basically what he tells Moe is this: “Wild animals have more physical comfort and security than my followers are guaranteed to have.” Remember, Jesus is heading towards Jerusalem where He will die. Elsewhere in the Bible Moe is described as a scribe, meaning he would have been educated and financially well-off compared to a lot of people back then. He would have been used to the comforts of life. Luke doesn’t actually tell us what happens next with this guy, but the implication is that he doesn’t follow Jesus. He looks back to his comfort and security, and that’s why Jesus answers the way He does. Do we look back to our physical comfort and security instead of looking to where Jesus wants us to go or to what He wants us to do? Because of fear, we miss many opportunities to see the kingdom of God in action in our city, even in this area around the church. Jesus is seeking disciples who are willing to put Him above their comfort and security, otherwise we are unfit for His kingdom. Notice I said “who are willing.” Following Jesus doesn’t mean we will lose our physical comfort and security, but we must be willing to. Am I willing? Are you? That’s a question we can sometimes answer too quickly, like Moe did. He reminds me of the parable of the Sower and the Seeds, specifically the seed that fell on rocky ground. The plant sprung up quickly, but when the hot sun beat down it withered and died. Jesus explains that by saying some people accept the word of God quickly with joy, but when troubles and trials of life come they fall away. They haven’t counted the cost. They look back to their comfort and security, like Moe did. d then dig them up and put them in an ossuary box – kind of like our urns today, but for bones instead of ashes. Either way, in those days in Jewish custom, burying family members was a huge deal. It took precedence over studying the Torah, serving in the Temple, preparing the Passover sacrifice, and even over circumcision. Priests, for example, were never allowed to touch a dead body because it would make them “unclean.” But they had an exception when it came to burying their own family members. Larry looked back to the Law, but the call of Christ to follow Him supersedes all other obligations, regardless of how good or right they are. Larry causes us to ask ourselves: Do we put our social, cultural or even legal obligations before Jesus? It doesn’t mean we can’t do those things and still follow Him. In most cases we still will do them. But we cannot give them priority over following Jesus either. When we do, when we look back to our social & cultural obligations, while making us good citizens, we make ourselves unfit for the kingdom of God. Finally, Jesus encounters a third man, and our fourth and final example. Can you guess what we’ll call him? Curly. And Curly initiates this time too, saying he will gladly follow Jesus, but he just wants to go and say goodbye to his family first. Just like Larry, he actually wants a good thing. Curly wants to fulfill the fifth of the Ten Commandments: Honour your father and mother. He might’ve been thinking of Elijah too, for that matter. When Elijah calls his disciple Elisha in 1 Kings 19, Elisha asks to go and say goodbye to his family first. Elijah permits him, and Elisha goes and makes a sacrifice to God and throws a big feast for his family before following him. So there’s even biblical precedent for Curly to expect this of Jesus. But putting conditions on God makes our way and our will more important than Him and His way. And if Jesus is to be our King and Lord, then that will never fly. Jesus is looking forward to Jerusalem where He’ll gain entry for all people into the family of God, but Curly looks back to his earthly family, and puts them before following Jesus. This of course brings to mind Jesus’ teaching ““If anyone comes to me and does not hate father and mother, wife and children, brothers and sisters—yes, even their own life—such a person cannot be my disciple.” He’s using hyperbole to be shocking. He doesn’t literally want us to hate our family, if He did He’d be contradicting Himself about loving one another – including our enemies – but He’s illustrating just how far above following Him must be than any other concern. It is excellent and praiseworthy to love our families. But do we love Jesus more than our spouse? More than our children? If not, then we make ourselves unfit for the kingdom of God. 1. Looking back to the past. 2. Looking back to safety and comfort. 3. Looking back to obligations. 4. Looking back to family. What other ways might we look back? Because, as humans with broken natures, who put Self first, it’s hard not to look back. Following Jesus means intentional, conscious commitment to subordinate everything in our lives – our comfort, our obligations, even our most precious relationships – to Him. Let me repeat that: Following Jesus means intentional, conscious commitment to subordinate everything in our lives – our comfort, our obligations, even our most precious relationships – to Him. That’s what it means to look forward! To die to ourselves daily and put Him first in all things. You can be a good religious person if you don’t, but you cannot be His follower, or His disciple. Back in Luke 9 Jesus goes on. In v. 23 He’d said whoever doesn’t take up his cross cannot be my disciple. In verse 24 He continues “For whoever wishes to save his life will lose it, but whoever loses his life for My sake, he is the one who will save it.” The other NT Lectionary reading for today, from Gal. 5, says that Christ’s call to follow Him is ultimately a call to freedom. So, we looked at four ways we can put our hands to the plow and look back – now let’s briefly look at four corresponding ways to look forward. 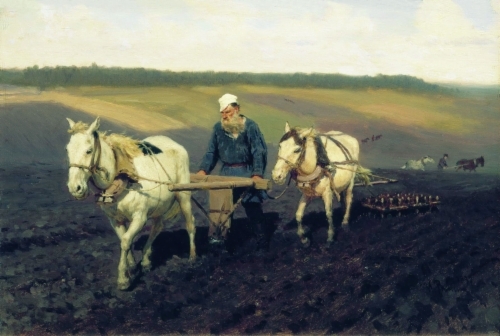 Tolstoy working on his farm. 1. Looking back to the past –> Looking forward to what God is doing in the here and now, and what He will do in the future. It means stepping foot into our communities, workplaces, and neighbourhoods, and praying that God opens our eyes to what He is doing, and how He wants us to join in. Jesus looked forward to His ascension, Luke tells us, even though the cross had to come first. 2. Looking back to comfort & Security –> Looking forward by giving resources generously & sacrificially. We are a blessed people, but it’s easy for us to put our confidence in our blessings. Giving generously & sacrificially will make us more like Christ, and make what’s important to Him important to us. It also reminds us that we are merely stewards of everything we have; God is the real owner. Jesus reminded Moe that his mission was more important than creature comforts, and so is ours. 3. Looking back to Obligations & Culture –> Looking forward by experimenting with new ways of being and bringing the Kingdom of God. It doesn’t mean we throw all our obligations, laws, and cultural customs out, but it means that we don’t allow them to prevent us from following God. Experimenting with new ways to be church (as you have done), or new ways of creatively engaging your neighbours, government, and even people who’ve wronged you. Jesus Himself often did that, like when He said “you have heard that it was said… but I tell you…” or when He healed on the Sabbath. 4. Looking back to Family –> Looking forward by being inclusively invitational, especially to the “least of these.” I’m thinking of what Jesus commanded in Luke 14: 12-14, when He said “when you have a dinner, don’t invite those who can pay you back, but invite those who can’t: the poor, crippled, & blind. Then you will be blessed, He says. That could look like inviting the “outsiders” at church, those who seem to remain on the periphery of this community, to your house for Thanksgiving Dinner. Or an exchange student with no family over for Christmas. It might even look like inviting that person with the dirty house and yard on that certain street or in that certain apartment over for coffee one day, to get to know them as a human made in God’s image. Jesus had a reputation for hanging out with sinners and drunkards, definitely not those in acceptable Jewish society. When you think of the ways you look back, what ways can you counter them by looking forward? At the beginning of our text this morning in verse 51 it says Jesus ‘set His face to Jerusalem,’ and at the end of our text in verse 62 Jesus makes it clear that He expects our commitment to Him to be just as determined, just as resolute. We will always move towards what we look at. And if we look back, at our past, our comfort, our obligations, our family, or anything else, we will not be fit for God’s kingdom. My friends, today and every day “Let us lay aside every encumbrance and the sin which so easily entangles us, and let us run with endurance the race that is set before us, fixing our eyes on Jesus, the author and perfecter of faith” (Heb. 12:1-2). Amen.